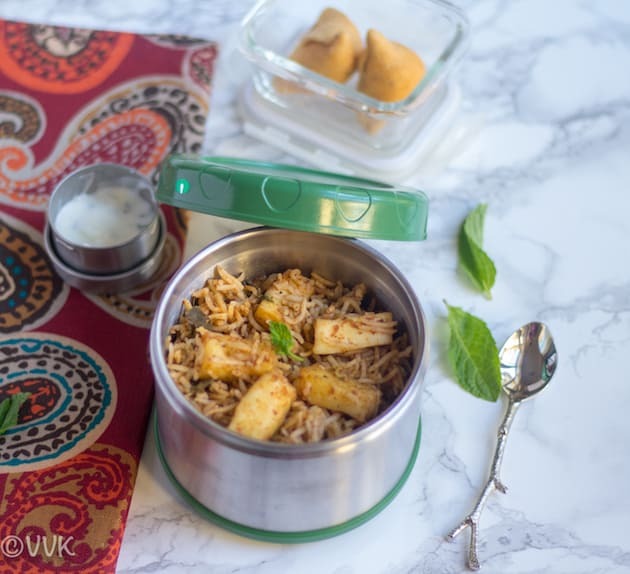 When it comes to vaandu’s favorite lunch box recipes, I cannot skip paneer recipes. Vaandu worships paneer and anything with paneer he is all up for it. 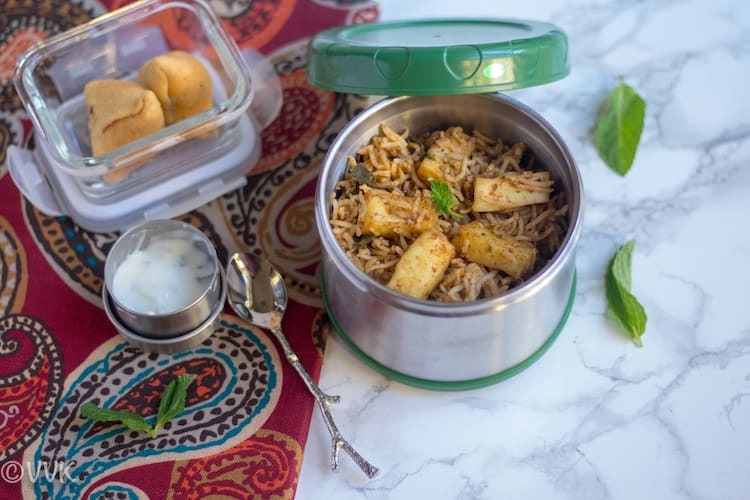 When I prepared my list, I just wrote paneer based dish for P. This paneer biryani was something that I wanted to post for a long time but shoveled it so that I can post now. I know, I posted a lot of semi-homemade recipes in this Lunch Box Series. But this one is from scratch. Do not worry about the time. 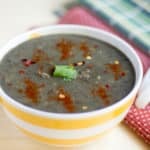 You can prepare this quickly even in the mornings. All you need is to chop some paneer cubes, onion, and tomatoes. Once that’s done, it is easy to prepare this dish. Before getting further into the recipe, I would like to thank my friend Ishu, for sharing this recipe. It is quite hard to cook in someone else’s kitchen. But my friend Ishu prepared this biryani for vaandu in my kitchen. Yes, I saw the live demo of this recipe. I am not sure if I can do that. Earlier, when I used to make biryani in the pressure cooker, I allow it to cook for one whistle. But even then, sometimes, the rice will become mushy, and it won’t be grainy. In IP, I do get a perfect consistency, and if I m not cooking on IP, I go for open pot method. But my friend shared how to get ideal consistency even in the pressure cooker. Here I am sharing the same. Do not soak the basmati rice for more than 20 minutes. The rice to water ratio is 1:1 + ½ cup water. So if you are using 2 cups of rice, then the water amount would 2.5 cups. 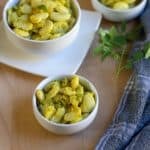 If you are using vegetables instead of paneer, use ¼ more cups extra. Do not add the pressure cooker weight initially. When the steam comes out of the vent, turn off the heat and then put on the weight. This process naturally acts as DUM for the biryani. When all the pressure has released, open the pressure cooker lid, allow it cool for 5 minutes. Then slowly fluff the rice. I hope this helps and please share any other tips that you have in the comments. 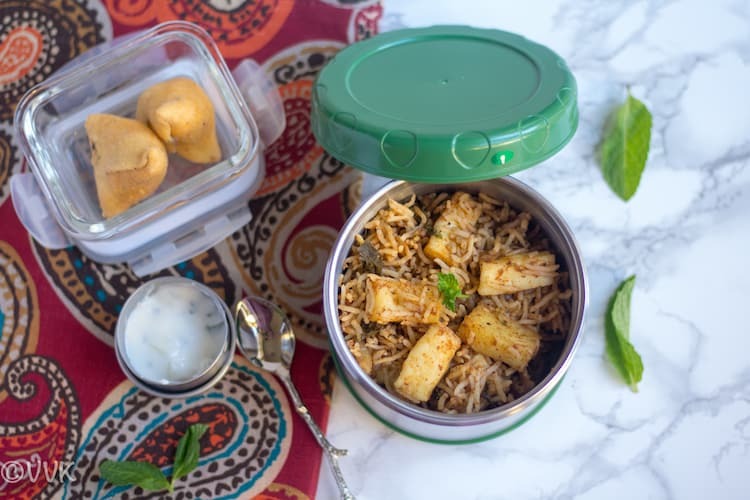 A lip-smacking not-so-spicy biryani recipe with just paneer and of course with exotic Indian spices especially with a strong flavor of cinnamon. Chop the onion, tomato, cilantro and mint leaves. Grind the tomato, ginger, garlic, cinnamon stick and red chilies into a smooth paste. Heat the pressure cooker or pressure pan and add the oil and ghee. When the oil is hot, add the bay leaf, cloves, star anise, mace and black stone flower. Saute for a minute and then add the onion and cook until they turn translucent. Then add the ground tomato mix, mint leaves and salt. Mix them all. Cook until all the moisture is absorbed. Now add the coriander powder and garam masala. Cook until the raw smell goes. Now add the paneer cubes and the water. Mix well. Ensure the paneer is coated nicely with the masala mix. Add the rice. Gently stir. Add the chopped cilantro and close the pressure cooker lid. Do not put the weight. Wait until the steam releases. Turn off the heat and now put the weight. Allow the pressure to release naturally and then open the lid. Let the rice cool for 5 minutes and fluff the rice and mix gently. As you can see, this recipe doesn’t call for cardamom. I did not add any but no harm in adding as well. If you like more spice, add red chili powder when adding the garam masala and coriander powder. I did not any. 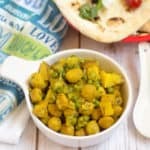 Instead of paneer, you can include mixed vegetables or tofu or soy chunks. 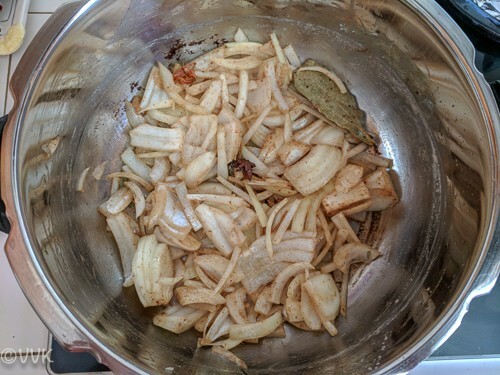 Instead of using fresh ginger and garlic, you can add the paste as well. Now add the paneer cubes and water. Mix well. Ensure the paneer is coated nicely with the masala mix. Paneer biryani looks so flavorful and tasty. I am not comfortable in cooking briyani by open pot method. I always prepare it in pressure cooker! This briyani looks really good and my kids will not complain if I sent this to school just because this has paneer!! The paneer biryani sounds very flavorful and I have to try your base for other veg biryanis. Please do try Suma. You will definitely love it. It is not easy to get this perfect texture of rice when cooking in pressure cooker. 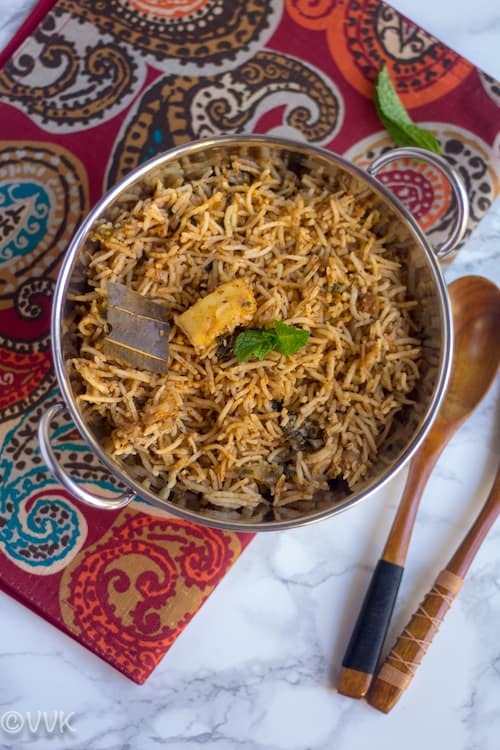 Love how beautiful this biriyani looks and who will say no to this aromatic and flavorful Paneer biriyani. We have to pack extra to feed the friends as well as it is so delicious. 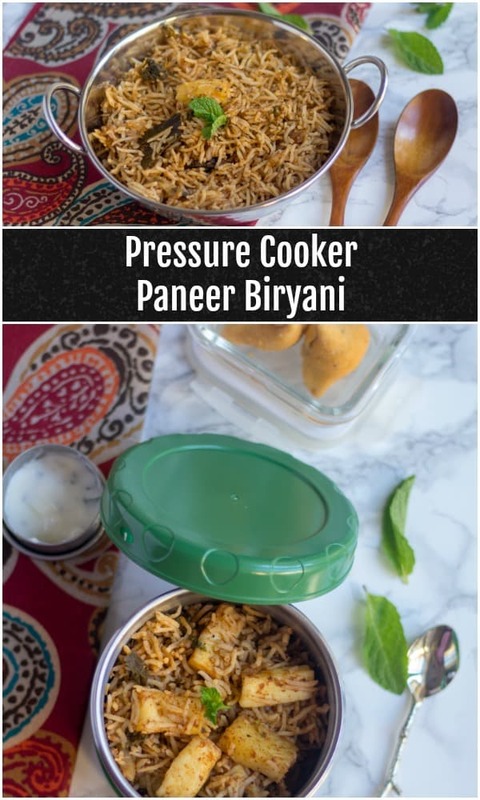 I too love making this kind of quick paneer biryani in the pressure cooker and have been making pulao and biryanis in pressure cooker only. From what I have felt the amount of water depends on the quality of rice. Anyways the biryani turned out amazing and it’s so nice of your friend to cook it in your kitchen. Totally agree, rice quality plays a major role. Thanks, Sapana. wow vidhya paneer biryani looks so delicious and am drooling here !! 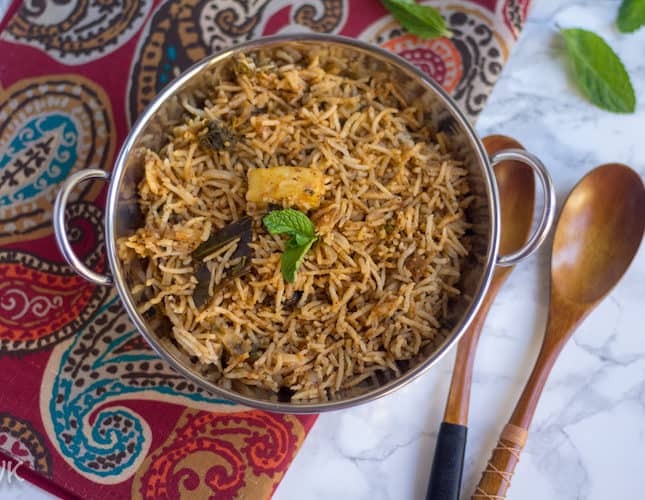 You have shared such wonderful tips no one can fail making a scrumptious biryani in cooker, I make my biryani and pulao in cooker too it turns out the best .. Your friend is so sweet to give you a live demo , I don’t think I could do live cooking too..Am so conscious, I don’t even like someone standing near me while I cook .. Such wonderful flavors added to this biryani !! This is fantastic Srividya, how many ever paneer dishes I have, I still drool over yet another paneer one..and this one will be so welcomed it being a one pot meal..excellent choice! Thanks, Valli. Same here. I love all the paneer dishes. That is a delicious and flavorful Paneer biryani Vidhya. My kids love paneer too and I make something similar for them at least once every 2 weeks. I agree with you – I have been able to make basmati rice consistently in IP. My pressure cooker rice was a hit or miss. Now a days I prefer making pulaos and biryani in IP. I can make plain basmati with pressure cooker with better results. Oh yeah, plain basmati rice is pressure cooker is easy than the biryani varieties. Thanks, Pavani. As I was scrolling down, looking at the pictures was making me drool. I haven’t as yet made paneer biryani at home. My bhabhi makes its very tasty and perhaps that’s why I haven’t made it as yet. :-) I know if we like someone’s recipe, we find it difficult to make it again. Paneer is one ingredient I can have daily. And this biryani looks wonderful. I have never made the perfect biryani in pressure cooker. It always ends up mushy. Will take your tips into account while making it the next time. Thanks, Gayathri. Please let me know, how it turned out. I have never ever cooked rice in a pressure cooker..never dared to..ha ha..it has always been a rice cooker or with discarding water, or double quantity water method. I have noted down your tips and once I try will give you my feedback. Thanks, Chitz… Hope it is helpful and let me know your feedback. 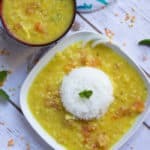 A very yummy recipe of vegetarian biryani. Thanks for sharing. Glad you liked it. 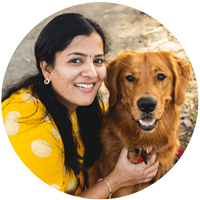 Thanks Sandhya and welcome to my space. Perfectly made. My kids don’t like just paneer and so I add veggies to go along. But this is definitely a flavorful biryani. Oh yeah, you can substitute it with any veggies. Thanks Harini. Wish you pack this biriyani in my lunch box. Absolutely irresistible paneer biriyani and my mouth is just watering here. 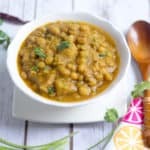 Who can resist to this incredible one pot meal. Paneer Biryani looks delicious,Vidhya. That ‘s so sweet of your friend, seriously i can’t cook in someone’s kitchen. And the tips on pressure cooking the biryani are great, will give it a try. After turned off the heat, do you transfer the cooker to kitchen counter or just place it in the stove itself?? since i’m using induction stove hence the question. Thanks Sandhiya… I have regular gas stove pa. So turned it off and kept it on the stove. But no heat though. You can set aside and it should be fine.